Color:blue,pink,black. Size:small 17 35cm,large 35 35cm. Weight: small 815g,large 1.5kg. Loading weight:small 10kg,large 15kg. You can also install the low space to make them suit its surroundings. You can also decide the height between the shelves. Trixie climbing step for wall mounting for rear side covered with plush. Lightweight and portable so it goes anywhere. It is also great for pets to step up into cars or trucks and other. Available in cream colour. Color:blue,pink,black. Size:small 17 35cm,large 35 35cm. Weight: small 815g,large 1.5kg. Loading weight:small 10kg,large 15kg. You can also install the low space to make them suit its surroundings. Add To Favorites. Color:blue,pink,black. Size:small 17 35cm,large 35 35cm. Weight: small 815g,large 1.5kg. Loading weight:small 10kg,large 15kg. Add To Favorites. It is very easy to install on the wall. You can also install the low space to make them suit its surroundings. 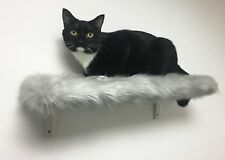 Apart from your couch sides and feet, you can also install these heavy duty vinyl cat furniture guards on your:Walls,Carpet,Mattress,Chair,Doors,Car seats,Couch arms,Screens,etc. 4 x Pet Couch Protector.